If you want some spells from a real Book of Shadows, here you go. I hope it doesn't matter that these are spells from MY own personal Book of Shadows, because that's what is on this page. As I have explained on another page, a Book of Shadows is a book that all witches write for themselves with spells and material that they want to record. You can carry it with you if it fits in your purse, but it's ok to just leave it at home near where you store your wallet or purse. This spell is also found in the money spells section. 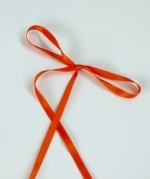 Drape or loop the ribbon near your bed (like over the bed post or door knob), but don't tie it in place. There can't be any unwanted knots in the spell. Use stones that are at least an inch across, not little chips. Anoint the red candle with cinnamon, and set it right in front of you. Light it and concentrate on all the stressful things in your life. As many as you can think of, even the little ones. Focus on that for a few minutes. Hold the jasper in your fist, and send all that stressful energy into the stone. Slide the candle (still lit) away, and put the piece of jasper nearby. Move the white candle in front of you, and anoint that one with lavender oil. Light it and shift your thoughts to being peaceful and how you will feel when these stressful things are gone. Sit quietly for a few minutes and leave the candles to burn on their own. Carry the piece of quartz with you to help you stay focused on letting the stress go. And like the other two spells, this one is already on the website as an example of a free online spell. So there you have it. A peek into some spells from a real Book of Shadows, which happens to be mine. These spells are just like most of the other ones on this site because I've selected this collection to represent the same type of witchcraft I actually practice. It's all the real deal.